You are here: Home Dance PuSh 2017: FOLK-S, Will You Still Love Me Tomorrow? PuSh 2017: FOLK-S, Will You Still Love Me Tomorrow? The show seems to have already begun as we take our seats. Six dancers stand in a circle on the dark stage, tapping their feet in synchronized rhythm. It takes a few moments to notice that they are blindfolded. They are creating musical accompaniment for their movements, using their other senses to keep time. Slowly the crowd grows quiet and the dancers’ feet become louder on the stage, the rhythm seeming to pick up speed. Signaling a change in their pattern, one dancer shouts “hey!” and they begin to slap their thighs, kick up their heels, and clap their hands in earnest. The blindfolds are soon removed, and the lights come up as eerie static sounds fill the space. The beating of the shoes provides a sonic backdrop, creating a meditative state for both the performers and the audience. Based on the schuhplattler, a folk dance traditionally performed in Bavaria and Austria, Alessandro Sciarroni’s FOLK-S was presented at the Scotiabank Dance Centre February 2 – 4, 2017. The piece deconstructs the schuhplattler and puts it back together again through repetition and variation. In a seeming never-ending loop, the dancers, wearing shorts, t-shirts, and sneakers, hold their imaginary suspenders while performing the same thigh-slapping, high kick sequence over and over. Sciarroni was the only dancer with real suspenders to hold; he was wearing traditional lederhosen complete with a feather in his cap. His character seemed to represent the traditional element of the folk dance while the others represented a contemporary reimagining of the movements. This, along with the choice to have one female dancer performing this traditionally young males’ dance, was indicative of a break with tradition and a move to a post-modern interpretation. The repetition risks becoming very tiresome for an audience, but just when it feels like they can’t possibly repeat the same sequence any longer, they switch to a slight variation on the theme — adding just enough interest and anticipation to keep our curiosity. The fatigue of repeated slapping was visible on their red thighs as they moved through a variety of formations: from a circle, to diagonals, to perpendicular lines, to abstract patterns moving across the stage. The dancers’ focus and determination to continue never wavered, and it seemed plausible that, as they threatened at the outset, they may continue until either we left or they could no longer endure the physical exertion. After a while, the incessant slapping, stomping, and clapping began to seem meaningless, almost in the same way that a word, when repeated too many times, loses all sense. Their steadfast faces and stoic repetition added to the lack of emotion elicited by their movement. Pauses punctuated the proceedings, allowing the dancers and the audience to breathe for a moment, while the dancers would look at each other, until one of them started tapping their foot, beginning the whole sequence anew. It was only during a melancholy scene involving Sciarroni and his accordion that the ceaseless foot tapping was put on hold. Sciarroni moved the red accordion in and out silently, slowly expanding and closing it, before placing it at the back of the stage and placing his hat on top. He was then the first dancer to walk through an upstage door and leave the rest of them to continue on their own. When the repeated sequence evolved and was treated to some twists and unique variations in tempo, direction, and order, the level of interest was strongest—such as the jumps that became so energetic they kicked their bums with their heels. The most compelling scene, near the end, involved the same movements with the accompaniment of a rap song. This change of tone allowed us to see the movement in a new light and gave it a refreshed meaning; this was also the only time they broke into a smile. Just as the show had no defined beginning, the ending was drawn out as dancers gradually seemed to tire of the repetition, leaving through the door upstage. A lone dancer was left to close out the show, and he walked over to the soundboard, chose a soft guitar track, and proceeded to perform the same sequence, albeit slower and more gingerly, in time to the song. He soon tired of this and continued the sequence while moving out the door, his hand lingering to wave goodbye, leaving us with a laugh. 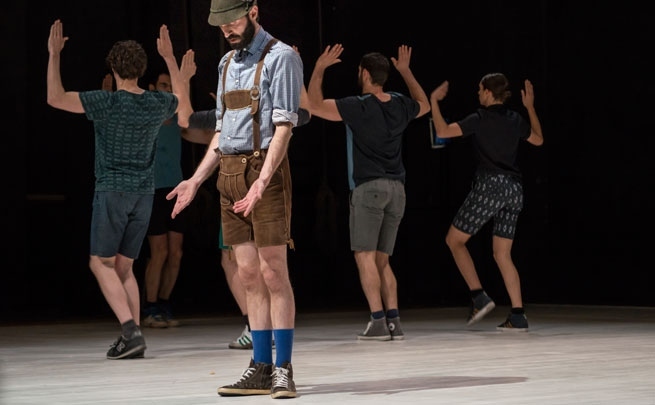 After seeing the same sequence performed countless times, by the end of the show I was sure the dancers could do it in their sleep; and I felt like even I could get up and repeat their schuhplattler. In a weird way, this display of perseverance, reverence, and determination was inspiring. If these dancers can repeat this slapping, tapping ritual for 90 minutes, pushing the limits of time and physical endurance, maybe there is similar inspiration to be found in the repetition of daily life .